Occasionally, a craving for curry hits me. I am a huge fan of spicy food, and Indian curry typically hits the spot. This recipe, as with most of my good finds, comes from Pinterest, and was a huge hit. The flavors from the marinated chicken are phenomenal, with a bit of spicy kick from the curry but also a sour kick from the lime. 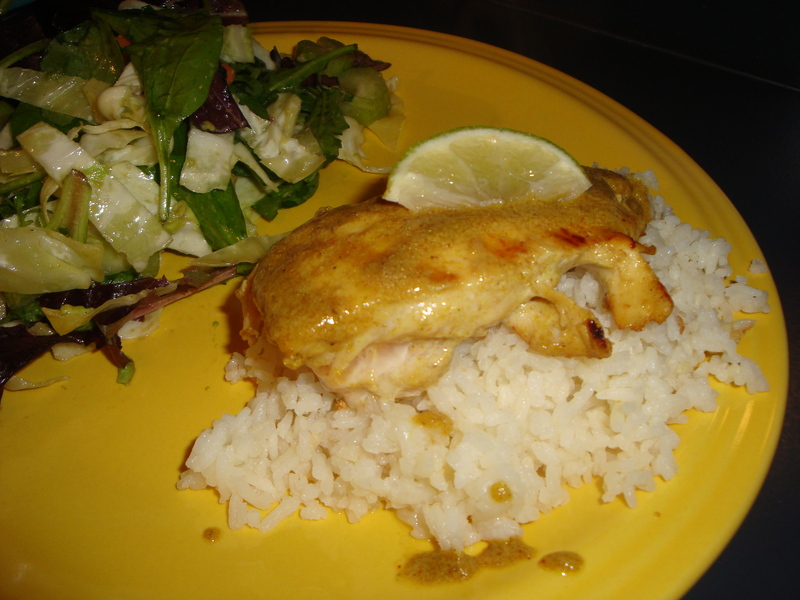 Another great aspect is the rice, which is rich and creamy and delicious. I found that just the smells in the kitchen while I was cooking inspired a feeling of calm and comfort, and, of course, excitement to dig in! In a large liquid measuring cup or medium bowl, whisk together the oil, lime zest, lime juice, cumin, coriander, soy sauce, salt, sugar, curry powder, milk, and cayenne pepper. Place the chicken in a large ziploc bag and pour the marinade over the chicken. Seal the bag and refrigerate for at least 2 hours and up to 8 hours. For the rice, bring the dry jasmine rice, milk, water and salt to a simmer in a medium saucepan. Cover, reduce the heat to low and simmer for 15-16 minutes until the liquid is mostly evaporated. remove from the heat and let stand for 10 minutes before fluffing with a fork and serving. Preheat a grill (as always, I used a Griddler) to medium-high heat. Grill the chicken for 6-7 minutes per side (actual time will depend on the thickness of the chicken). While the chicken is cooking, pour the marinade into a small or medium saucepan. Bring the mixture to a rolling boil and boil for 10 minutes, stirring occasionally. Place the grilled chicken on a serving platter or plate. Drizzle with sauce (reserve the remaining sauce to serve separately) and sprinkle fresh cilantro over the top. Serve with lime wedges and additional sauce. 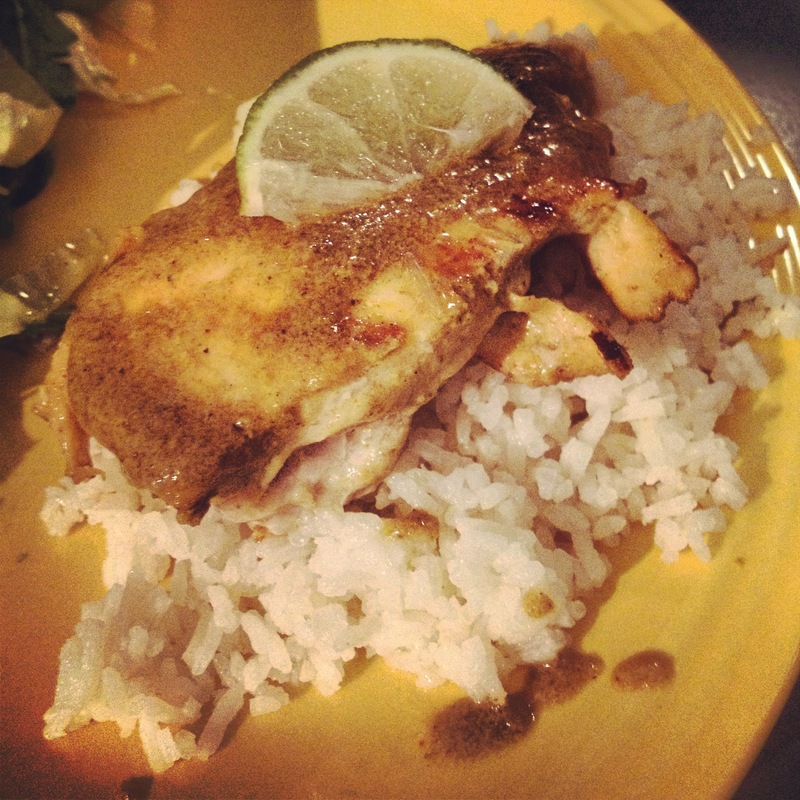 Posted on September 29, 2013 by Jilly G	• This entry was posted in Recipes and tagged chicken, curry, indian, lime, rice. Bookmark the permalink. Looks delicious! I need to try this sometime! !